Polymer clay baked on objects are really exciting projects for children and adults. They are for both decorative and useful items. See my Clay on Glass Projects. 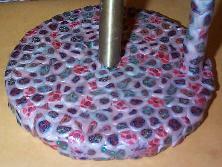 I felt that it was time to show pictures of some of my more recent clay projects baked on other substances. What to do with the deformed canes and slices! 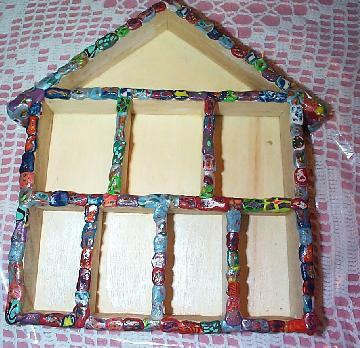 My sons found this wooden house shaped miniture wall rack at the Dollar Store! Micah (age 10) took all of the scrapes of old canes and covered the sides and top. Many clay teachers end the camp season or class sessions with extra canes. The ones that no one like to use, deformed, twisted etc. These slices can be used if you just have fun! General rules for covering objectsMake sure the object is clean. Watch or check when baking to make sure the object is safe in the oven. Watch for melting or cracking. 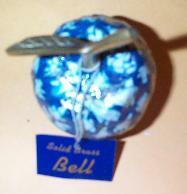 I found a solid brass bell at my local discount store. I just had to try covering it with Sculpey cane slices! My kids say it looks good but it makes the bell ring softer. I had a copper paper towel holder that was starting to look a little worn. SO of course I had to cover with polymer clay. Actually it was looking real bad! I decided to use some canes and slices from a class of less talented students that got a little carried away with covering the canes with a pearlized pink. I covered the top that would be exposed at the top of the paper towel roll. I also covered the rusting copper rod that I think is there to help you rip the paper towels.